How did DOCK actually start and how was the concept created? Dive Operator Community Komodo (DOCK), initially called Komodo National Park Dive Operators Association (KNPDOA), was initially founded sometime around 2008 as a response to the need of a unified voice in the growing dive industry in Komodo National Park by ensuring quality service, safe diving practices and community efforts. DOCK has also outlined dive safety rules and conduct for guests, guides and boats operating in the park. These rules are established by combining years of knowledge and experience diving in Komodo National Park. The guidelines are considered the benchmark when diving in Komodo. How would you explains DOCK's primary purpose? DOCK’s is dedicated to help support and protect the Komodo National Park as a UNESCO World Heritage Site, to ensure the future of Komodo and its unique marine environment are still preserved for many generations to come. Maintain high standards of safety, customer service, environmental protection and fair employment among dive operators. Foster co-operation, mutual support and the upkeep of ethical business practices among members. Collaborate with local government, Komodo National Park Authorities, local NGO’s and communities. Support projects which conserve and improve the marine ecosystem, respect local culture and grow the local economy. Raise awareness of The Komodo National Park and the challenges this area faces. DOCK has created a dive community sharing news and support. How big do you want this community to be and how can dive operators join? Ultimately, the wider the community, the better it will be for the diving industry in Labuan Bajo. The number of dive operators in Labuan Bajo may not be as big as other tourism operator groups, but only by working together, greater things can be achieved. One of our favourite quotes is from Margaret Mead - “Never doubt that a small group of thoughtful, committed citizens can change the world; indeed, it's the only thing that ever has." To become a member of DOCK, simply send an email to info@diveoperatorskomodo.com and representative from the DOCK Boards will get in touch with the potential member directly. They can also contact current DOCK dive centers for any questions or even attend one of DOCK regular meetings to meet some the members and learn more about DOCK. What is your top priority project or projects right now? Starting from March, we are officially entering the 2019 season. One of our current running project is the Save Money Save Komodo initiatives. As we all know, the Komodo National Park is the magnet for visitors, both domestic and international, to visit the main gateway town of Labuan Bajo. This rapidly developing tourist hot spot used to be popular for one reason – the Komodo Dragons. However, as the areas has grown in popularity the underwater world has been discovered as well. People flock to the area to encounter the majestic manta rays and impressive coral reefs. The tourism sector is rapidly expanding, and the Indonesia government has plans to develop Flores as one of the ‘ten new Balis’. Whilst this will cause a welcome economic boom for the area, there is one thing that concerns the community – increasing waste. The issue of plastic has become global news over the past two years, with nations pledging to cut down on plastic and many countries and island even banning some forms of single use plastic – as we can see in various part of Indonesia as well. There is increasing scientific evidence that plastic in our oceans is causing huge detrimental effects – from smothering corals to contaminating fish. Clean-up events are increasing in popularity as people take to social media to show their efforts, however reduction of plastic use is the number one long term solution. A collaborative step is definitely needed to tackle the waste problem and this is what DOCK aim to do! 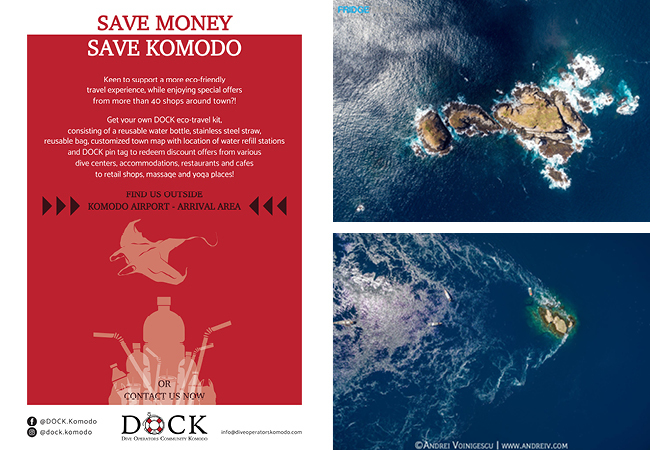 In a first-of-its-kind initiative, DOCK have started the ‘Save Money Save Komodo’ campaign. One of our member, Ed Statham from Wunderpus Liveaboard, initially came up with the idea; to reach out to visiting tourists, educate and encourage tourists to travel sustainably, equipped them with suitable supporting tools, and encourage more eco-friendly businesses at the same time. Upon their arrival at Labuan Bajo airport, visitors will be presented with the opportunity to purchase the DOCK eco-travel kit that consist of a reusable straw, bags & bottles as well as a town map with a list of water refill stations to reduce their single-used plastic consumption. Upon purchasing the kit, they will then be entitled to various discounts and offers from 16 DOCK Dive Centers and more than 20 DOCK supporting restaurants, cafes, spas and accommodations. The community of Labuan Bajo has really come together to support the reduction of single-used plastic waste, and it is inspiring to see! At the same time, our collaboration with local government, NGO and communities are still on-going. We support local communities such as Trash Hero Komodo and Eco Flores in the effort to tackle waste issue around Labuan Bajo from grassroot levels. We are in the process right now of assisting WWF and the BTNK with their upcoming monitoring programs. We also collaborate with other tourism stakeholders in the area, such as the West Manggarai government, the Tourism Authority Body (BOP), Swiss Contact and local tourism associations. In an ideal world, what are the top things would you like to tick off your list? In other words, what are your most critical issues that need fixing? The Komodo National Park grows in popularity each year and to ensure that the beauty that brings people here remains, collaborative action is needed to help all parties with ensuring that the management of the marine park is effective as it can be; both as responsible dive operators, tourism stakeholders and generic park management. We plan to work with stakeholders to increase mooring lines, effective and continuous implementation of the current Komodo National Park regulation, and support developing waste management practices. How can the Flores community and visitors to Flores help? There are some easy ways to help keep Komodo and Labuan Bajo beautiful. Reducing your waste and your plastic footprint is a big part of this. Refuse plastic straws and always carry a reusable bag and bottle. Don’t have some or all of these yet? Join the ‘Save Money, Save Komodo’ campaign and get your own eco-travel kit. Trash Hero and Flores DMO have set up water refill points throughout Labuan Bajo. The locations of these can be found on our town map in the eco-travel kit. These small changes in your day to day life and the way you travel also reducing impacts and always try to encourage others to do the same. Also be sure to choose a dive, snorkel or trekking trip with a company that aims to reduce negative impacts and gives back to the community. When it comes to diving, DOCK dive centres not only adhere to certain safety standards, but also commit to community projects and pledge to reduce plastic use and to making their business as environmentally sustainable as possible.